Listen to Dr. Nasha Winters, a cancer survivor — and thriver! — talk about her work with cancer treatment and her program: The Terrain Ten. Dr. Nasha Winters’ holistic approach emphasizes that a person is more than the sum of their diagnosis. It honors that how we find ourselves with a cancer (or other chronic illness) diagnosis does not happen in a vacuum. All of our life experiences, as well as our childhood traumas, affect how our genes are expressed, and in fact, can make a more significant impact than any one-specific dietary, supplemental or prescription treatment! 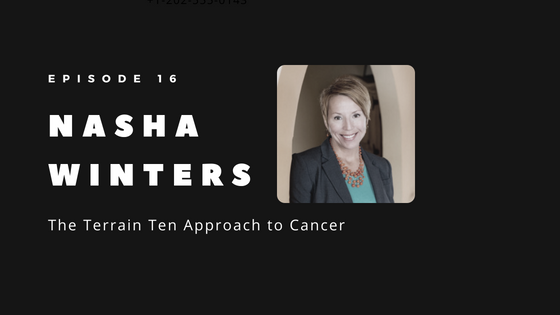 To be a cancer thriver, Dr. Nasha Winters believes we must take a whole body, mind, spirit approach. Dave Korsunsky, founder of Heads Up Health, talks with Dr. Winters about psychoneuroimmunology and how the whole body, mind, and spirit are interlinked, and how optimal health cannot be achieved without addressing them all. Dr. Winters also talks about the top five labs that she monitors monthly in all of her patients with active disease processes, and why you should be checking these at least a couple of times a year to maintain your own health. Nasha Winters, ND, FABNO, L.Ac, Dipl.OM, has over 25 years experience with direct patient care. She is a best selling co-author, a speaker, and an educator. She is the Founder of Optimal Terrain Consulting, offering integrative oncology, philosophy, and methodologies. You can follow Dr. Nasha Winters and her work on Facebook, LinkedIn, and her website Optimal Terrain Consulting. This podcast is brought to you by Heads Up Health, a web app designed to help you centrally track all of your vital health data. Instantly synchronize your medical records, connect your favorite health devices like the Oura Ring and apps and use your data to optimize your health! Molecules of Emotion, by Candace Pert, Ph.D. The Biology of Belief, by Bruce Lipton, Ph.D.